Finally back at it! 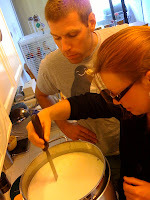 My friends Stephen and Sarah came over this afternoon to help out with a batch of Gouda. It was only 3 1/2 hours from starting to pressing at the full 50 lbs. ... so much faster and easier than cheddar*! Tomorrow morning I'll brine the cheese** for 12 hours, and then move it to the fridge to dry for a couple of days... then a few layers of wax, followed by a lot of patience. Check back in four or five months to see how it turned out... okay, maybe just three months! ** Instead of directly salting the curds, the salt is added after pressing--like Haloumi--by soaking the wheel of cheese in a saturated saltwater solution. The salt is simply absorbed while it's soaking, and will eventually make its way throughout the cheese during aging.